Luke endeavors to learn the truth about Shira. Luke & Chewbacca scramble away from Darth Vader, only to quickly realize he is merely a recorded hologram. Vader reveals to Luke that Shira Brie was really his agent, inserted into the Rebellion to kill or discredit Luke. Determined to learn the truth, Luke & Chewbacca head for the Imperial data center on Krake's Planet. 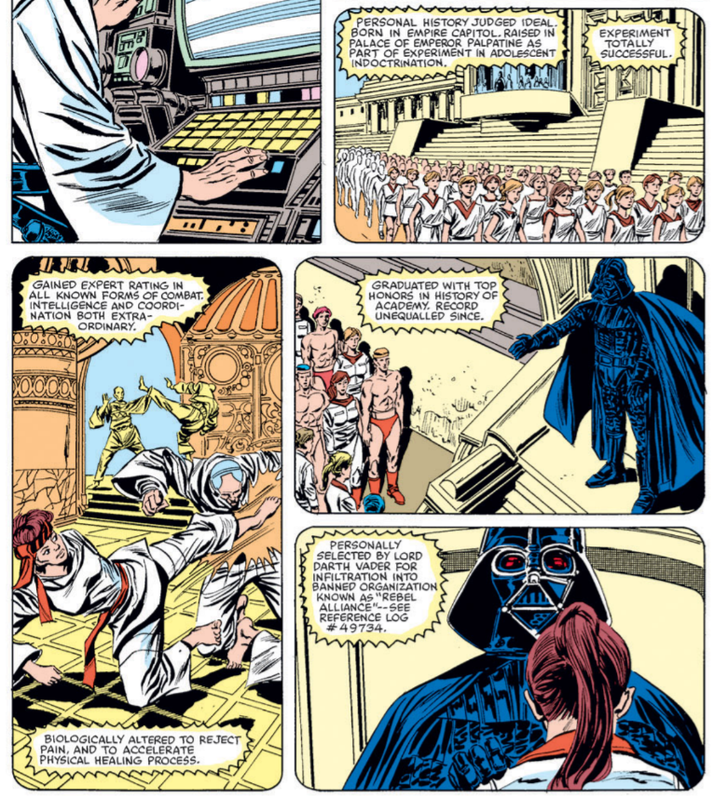 When Vader learns the communication device on Shalyvane has been destroyed, he deduces Luke's destination and sets the Executor on a course for Krake's Planet as well. Luke & Chewbacca manage to infiltrate the facility and strong-arm an officer into giving them access to the data, at which point Luke confirms Shira was indeed an Imperial agent, trained by the Empire since childhood. Their presence detected, Luke & Chewie are separated, and Luke is unable to retrieve the file on Shira as he scrambles to escape. As Vader arrives in orbit, Luke retrieves Chewbacca, and using the Falcon's deflectors to destroy the base, they escape the planet & jump into hyperspace just ahead of the Executor. As they fly home, Luke learns that Chewbacca managed to retrieve Shira's file to clear his name, while Vader visits a medical bay deep inside his ship, where he tells an unconscious but healing Shira Brie he still has need of her. 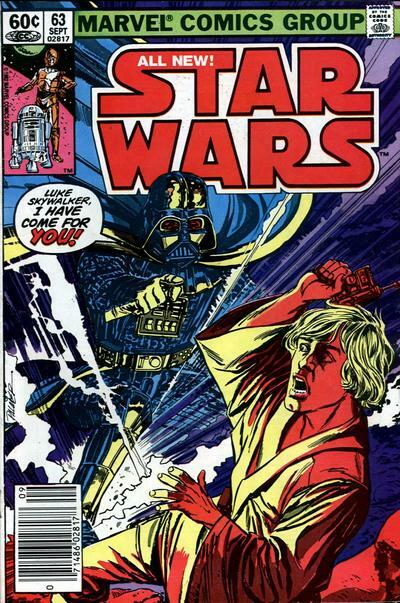 This issue reveals that Shira Brie is an Imperial agent, working directly for Darth Vader to either kill or discredit Luke Skywalker amongst the Rebels. Later stories will retroactively establish that she is Force sensitive, and declare her to be one of the Emperor's Hands, a group of Force-sensitive assassins and agents that answer directly to the Emperor, introduced in the later Expanded Universe. It's also revealed that Shira remains alive, and is being treated aboard Darth Vader's Executor. She'll next appear in issue #88. 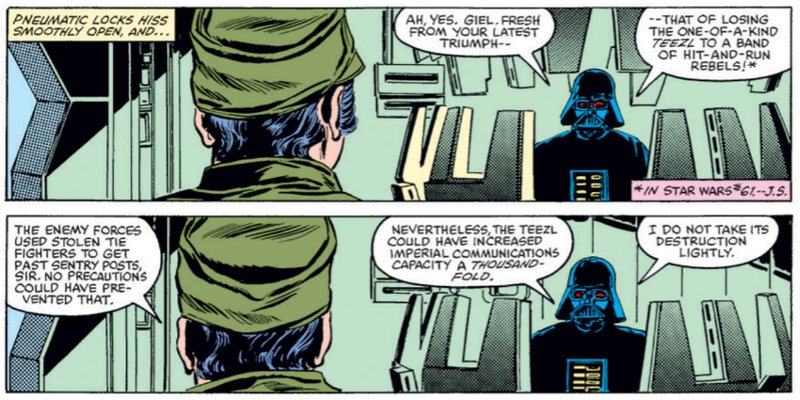 The timing of Vader's plan and Shira's involvement in it is a little shady. It's said that she infiltrated the Rebels "years ago" in order to get close to Luke (the idea being she was specifically inserted to go after Luke). This takes place shortly after Empire, which takes place three years after A New Hope. 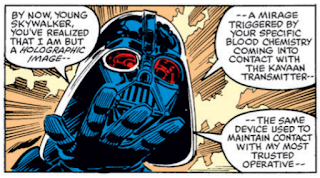 Even based on the continuity of this series (regardless of what came later or what is currently canonically), Vader only learned that Luke was the pilot who destroyed the Death Star until shortly before this series' adaptation of Empire. Presumably, had Shira infiltrated the Rebellion by then, she'd have learned (it was no secret amongst the Rebels) and told Vader, but then, if she was supposed to target Luke, why would she have been inserted before Vader even knew Luke existed and was someone to target? Obviously, there's No-Prize explanations for some of this, but clearly Michelinie just threw "a few years ago" into the script without really thinking through the full implications of the timeline. 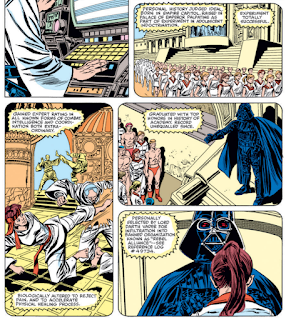 This issue also introduces Krake's Planet, the site of a massive Imperial data storage facility; it's a place already known about by Luke & Chewbacca when this story begins, which makes it seem like a wasted opportunity to have not at least mentioned it in an earlier story. By the end, the Imperial facility is somehow destroyed by the Falcon's deflector shields when Luke & Chewie flee the planet ahead of Vader. 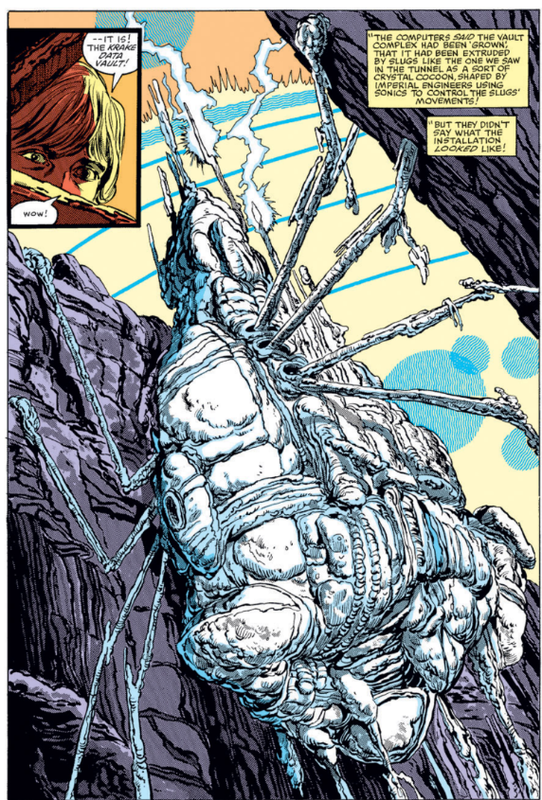 Tom Palmer, who's been the dominate artistic presence finishing Simonson's layouts for the last few issues, is here credited as both penciler and inker, with Simonson credited with "plot and storyteller"; presumably his layout work was even more minimal than in the past. 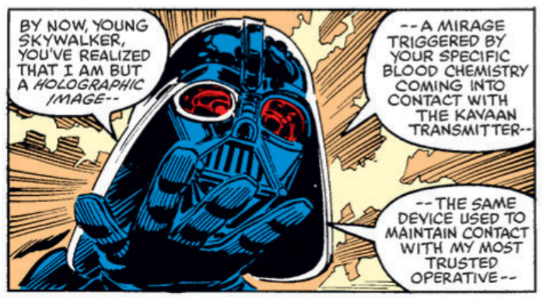 Vader says the device Shira used to communicate with him was keyed to her blood, and to Luke's, though it's unclear how Vader would know what Luke's blood chemistry is. 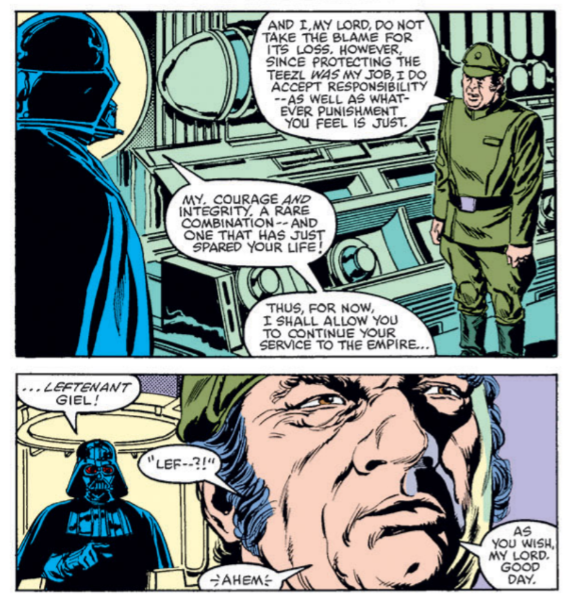 With the Vader recording concluding that Luke is now a pariah amongst the Rebels, he urges Luke to come to him, effectively repeating his entreaties from the end of Empire. Vader's meditation chamber from Empire appears briefly. 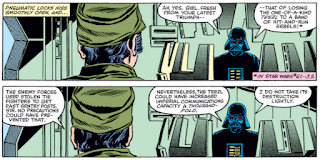 For his failure to prevent the destruction of the Teezl two issues ago, Admiral Giel is busted down to lieutenant (though Vader says "leftenant" - I know that's a term for lieutenant, but I'm not sure why Vader is using it), but he does at least avoid Vader's usual punishment for officers who failed him. It is said that Shira was raised and trained on Coruscant (again called simply the Imperial capital here). 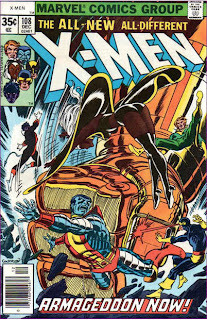 The destruction of her "hometown" on Shalyvane, referenced last issue and in issue #60, was part of the effort to insert her into the Rebellion. Plif, leader of the Hoojibs, appears briefly, to give Leia someone to talk to. A pair of Stormtroopers in this issue are named Turk & Grotto, a reference to henchmen characters with the same names and general demeanor/relationship from Daredevil. 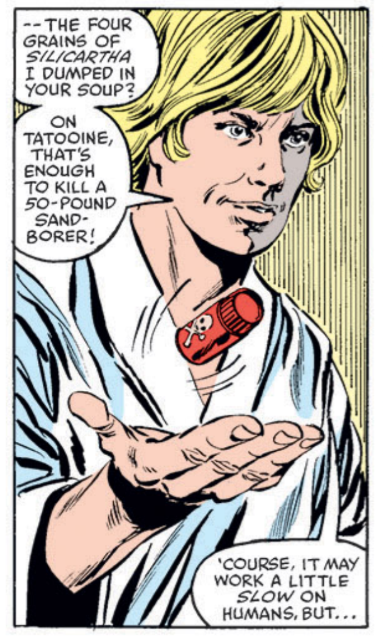 Luke pretends to poison an Imperial officer with silicartha, something found on Tatooine but apparently well-known throughout the galaxy. This issue is another example of Michelinie & Simonson having the characters do something to get out of a short-term jam in a manner which, in all actuality, should drastically change the power balance between the Rebellion and the Empire. Previously, we had four Rebel pilots taking on an entire Imperial armada, with Luke able to take out an entire Star Destroyer himself. Here, he and Chewbacca somehow use the Falcon's shields to destroy an entire Imperial data facility, just to get away. Imagine what they could do if they tried? Why isn't the Falcon flying from planet to planet, blowing up bases with its shields? 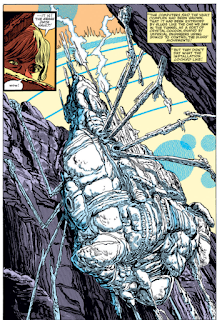 It seems like such a trivial need - Michelinie & Simonson could have easily just had the ship escape thanks to its great speed, the characters having already exhausted a lot of luck in infiltrating & escaping the base - for such a big break in the suspension-of-disbelief. All that aside, this is where the big Shira Brie reveal happens. Even though I'd never read these issues before, I was aware of Shira's true loyalties, so it's hard to know how effective a twist this really is, but it seems, for the most part, like a well-played one. Shira's (fake) origin in issue #60 came at just the right time, reading then like a new supporting character finally getting her spotlight but now as an integral part of the ruse. 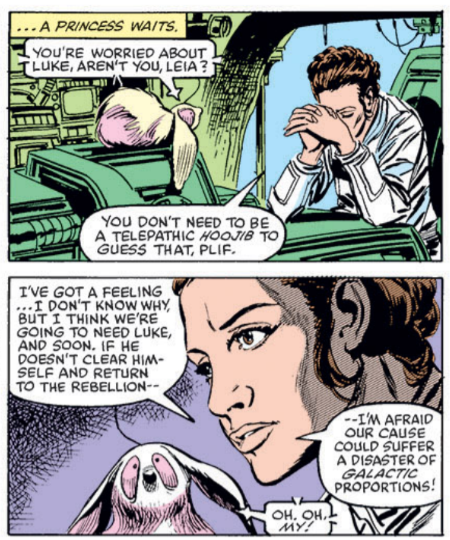 The twist that the Force wasn't lying to Luke in issue #61 when he shot Shira, that it simply knew the truth better than he did, is great. 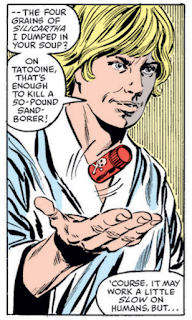 It makes perfect sense, but also doesn't make Luke look like an idiot for never suspecting as much. Even the technical problems in issue #58 read differently now, with the near-failure of the Rebel's fleet-protecting shields now possibly the work of Shira. Some of the specifics of Vader's plan, particularly the timing of it, are a bit dubious, but otherwise, the Shira revelation (and the revelation that she's still alive) successfully transitions her from one of the things this series always needs - an original supporting character whose fate isn't tied to the films - to the other thing this series always needs - an original villain whose fate isn't tied to the films. 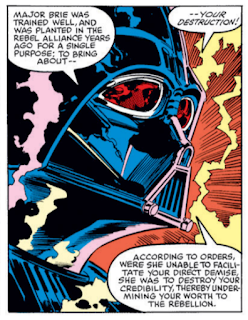 And giving her a personal grudge against Luke makes her a perfect stand-in for Vader. It'll be a while before she next appears, but she already holds up as one of the series' most successful original creations. 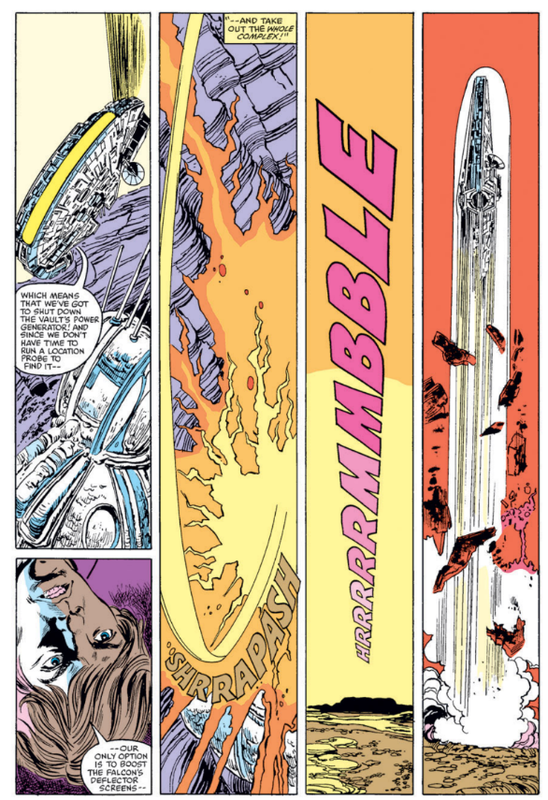 A quasi-fill-in as Simonson & Palmer take a break. Shira having infiltrated the Rebels years ago isn’t the only timeline quirk. 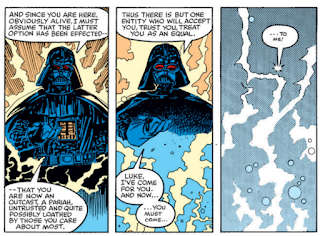 The Vader portion of this story felt pre-Empire to me due to his dead-or-alive vendetta against Luke, reinforced by Luke sporting those old moisture-farm togs. I’m not sure how often the Rebels could target Imperial facilities and have Luke (or Lando) & Chewie ram the Falcon, shields on max, into their power generators before the Empire increased the generators’ own shields and/or beefed up defensive details to the point the Rebels couldn’t risk the casualties — but then again ridiculously vulnerable equipement is, like, the Empire’s thing. Anyway, I was more surprised by Luke’s ability to control that Imperial security officer’s mind with the Force. My favorite moment, though: Luke, acknowledging that the stormtroopers are terrible shots, is worried that one could still blast him by accident.